This is the perfect food lesson for this time of year. Oh how I love gravy. I love it on biscuits, mashed potatoes and everything else! However, it must be lump free. We all have been there eating some one’s lumpy gravy with a tortured smile and forcing out an mmmm…good. Alton has perfected this process of making a smooth and absolutely lump free gravy.The Joy of Cooking says gravy is meat drippings and a starch, if there are no meat drippings, it’s nothing more than a sauce (i.e. béchamel). The best way to add a starch is in the form of a roux. There are other methods, but it takes a very long time to get the raw flour taste out of the gravy.Making a roux with a saucier would be best. For those of you that don’t know a saucier is basically a pot with sloped sides that allows for easier whisk access. I don’t have one of these, so I’ll have to do without. But it is on my wish list! Before we get into the gravy recipes, we need to make the meat drippings. I decided to make a pancetta wrapped pork roast, but you can make any roast that you want just so that you have some juices to make the Roast Drippings Gravy. At this point you basically have a jus which could be used to sauce your roast. To create a gravy, reduce the heat to medium and whisk in 2 tablespoons of white roux (see recipe below). Return to a simmer, whisking constantly. Continuing to cook once a simmer has been reached will result in a smoother sauce, but not a thicker one. Since all starch thickened sauces thicken as they cool, it’s a good idea to make your gravy a little on the loose side. The guys said the gravy was really, really good. I’m sure the pancetta added to some of the great flavor. It was super easy to make and is so much better than those packets you can buy in the store. Heat fat or over medium high heat. Add flour all at once whisking vigorously. When mixture thins and starts to bubble, reduce heat to low and cut back on the whisking. Cook until you smell a toasty aroma then cook 2 minutes more, stirring occasionally.Roux can be used immediately to thicken a liquid that is at or below room temperature. To thicken a hot liquid, allow roux to cool to room temperature, or refrigerate.Tightly wrapped, roux can be refrigerated for up to a month. Simply break off pieces and use as needed. Rouxes can be cooked from varying degrees of darkness. The darker the roux the less the thickening power. Some people can actually differentiate between a bunch of rouxes, but that’s a little advanced for the majority of us. I needed to add a little more fat to get the right consistency but it still turned out great. 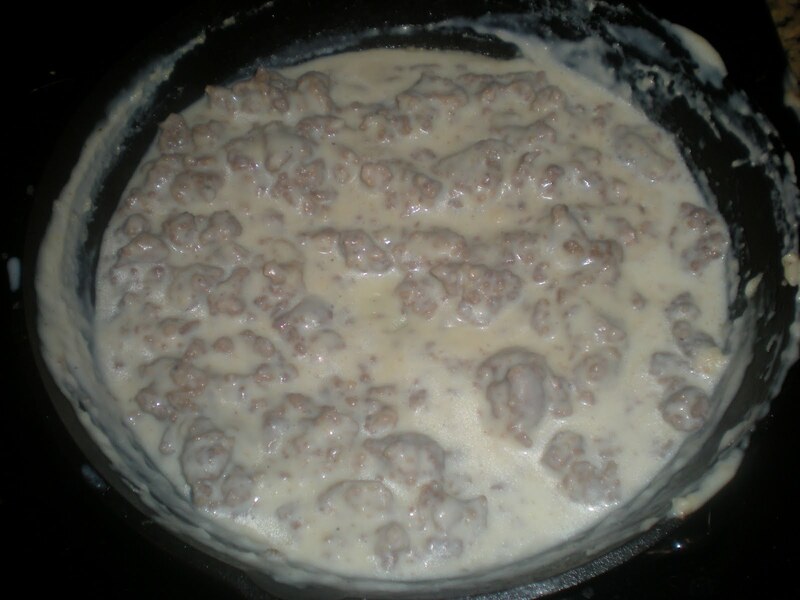 Cook sausage in a cast iron skillet. When done, remove sausage from pan and pour off all but 2 tablespoons of fat. Whisk flour into the fat and cook over low heat for 5 minutes. Remove pan from heat and whisk in milk a little at a time. Return to medium-high heat and stir occasionally while the gravy comes to a simmer and thickens. (Be sure to scrape up any brown bits that might be stuck to the bottom of the pan, that’s where the flavor is.) Check seasoning, add crumbled sausage and serve over toast or biscuits. My mom always used maple sausage when I was growing up so it’s the only kind I use when making sausage gray and it turns out very flavorful. I never get enough fat off the sausage to make a proper gravy so I always have to add a little butter or vegetable oil. I had some left over biscuits from the biscuit episode before. I warmed them up and poured the gravy over. If you want a really thick gravy like I did, use the entire pound of sausage, but if you want a thinner gravy just use about half. 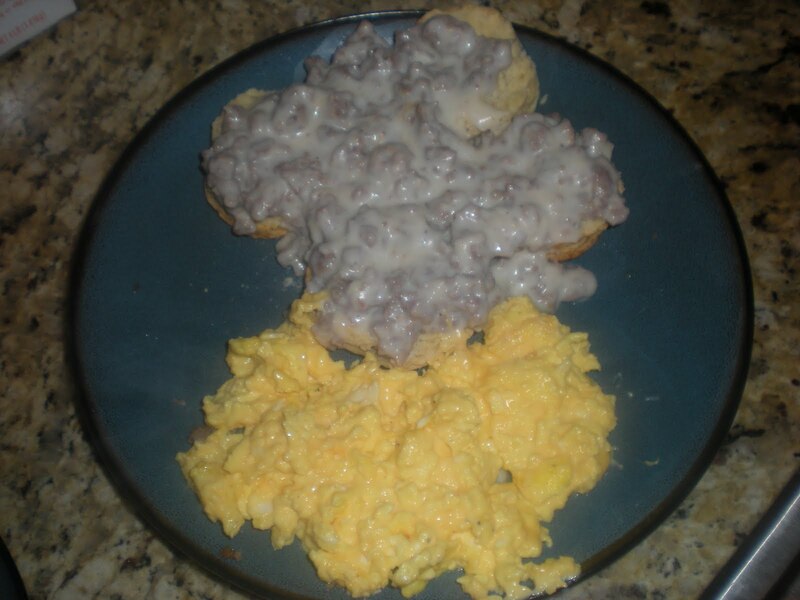 I would have to say it’s the best biscuits and gravy I’ve made to date.